I can’t say I want to “celebrate” the ten-year anniversary of our bike wreak, so I’ll simply notice it today. Maybe we can celebrate that life went on after it. Under only slightly different circumstances, we could both have died, which is sobering. Ten years later, Mauri still wears the orange parka he wore that day, shredded on both sleeves, small protection from severe road rash as he scraped the pavement. We still ride. Not the same tandem (though it was repaired), not as the serious long-distance riders we once were. My ankle healed, though not fully and not for a long time. A couple months after the blowout, I recognized the EMT in a doctor’s office waiting room. I reminded him of his rescue and he said, “Of course I remember you; you’re the worst ankle I’ve ever seen. You know all that morphine I gave you? That was for my sake, not so much yours.” So yes, this is a day to remember, not so much to celebrate. What else would we want to do with a beautiful, sunny Saturday than take a tandem ride? We rode around town a little bit, through the university, then decided to tackle a first-of-the-season hill. Mauri kicked it down a gear or two so we didn’t have to work too hard, but we felt ready for the reward of the downhill at the turn on North Valley Road. At around 20-25 mph, we suddenly blew our front tire and in a moment found ourselves sliding on our left sides down the middle of the road. Thankfully no oncoming cars had made the curve ahead to discover us, sprawled–possibly too late to stop. Mauri stood up to assess his wide-spread and fairly severe road rash. One look at my left foot bent all the way backward assured me I had broken something. Some Good Samaritans called 911 and took our bike home. EMTs were in the neighborhood and kindly helped us to the hospital. An ER nurse cleaned up Mauri’s scrapes and I got good attention. 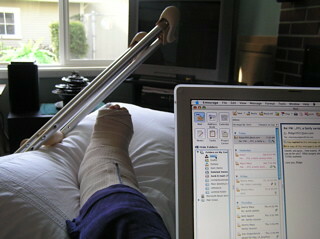 I have a compound fracture of the fibula or tibia (I can’t seem to remember which) and maybe both. We’ll find out tomorrow when we see the bone specialist, who will schedule repair surgery probably for Wednesday. I’ll keep you “post”ed. Meanwhile, this is what my office looks like. I’ve worked at NFC more than two and a half years and now I finally have a good excuse to take a sick day. Might even take two!